ANNA HILLS GALLERY: The Art, History, Biography & Paintings of ANNA HILLS [1882-1930]. We are active buyers of Anna A. Hills paintings! Anna Althea Hills was an American artist who became an important member of the California school of Impressionism. She was born January 28, 1882 in Ravenna, Ohio, and later received her artistic training at the Chicago Art Institute; Cooper Union Art School in New York City; she worked with Arthur Dow (1857-1922) and later studied at the Academie Julian in Paris. While in Europe she studied with John Noble Barlow (1861-1917). In 1912 she moved to Laguna Beach, California becoming a leading member of the Laguna Beach art community. 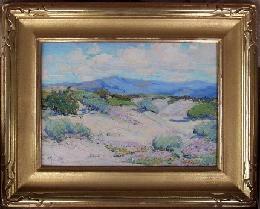 She was an active member of the California Art Club, held a membership at the Washington Watercolor Club and served at the Laguna Beach Art Association as president from 1922 to 1925 and from 1927 to 1930. Captivated and inspired by California's varied landscapes, she painted atmospheric coastal views, treescapes blowing in the gentle winds off the Pacific, the inviting Laguna Beach coastline, historic Mission San Juan Capistrano, the vast Southern California and Arizona deserts, Santa Ana Canyon, arroyos and interior scenes. As an art teacher she encouraged the study of the visual arts at the local public schools. 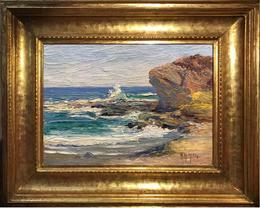 She taught and painted in the plein air style of painting, frequently she was seen on the cliffs in Laguna Beach with her students to give her class the experience of painting outdoors. She died at the early age of forty-eight on June 13, 1930 in Laguna Beach, California. Hills won the Bronze Medal at the Panama-California Exposition, San Diego in 1915; the Bronze Medal at the California State Fair, 1919; and the Landscape Prize at the Laguna Beach Art Association, 1922, 1923.